An arcade multiplayer game with MOBA elements. Switchblade has been developed by Lucid Games, a studio comprising of the creators of the Project Gotham Racing series. 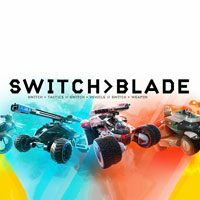 Switchblade is a yet another game developed by Lucid Games, also known for creating a shooter game called Geometry Wars 3: Dimensions. The game is not very widely known of, however, the developers are already experienced, as they previously worked for Bizarre Creations - the studio, which created the Project Gotham Racing series. Switchblade for PS4 and PC is based on the free-to-play business model. During the game, a player gets to participate in the futuristic sports championships resembling a combination of Rocket League and League of Legends. Switchblade for PS4 and PC is an automotive MOBA game. Similarly to other games representing this genre, players join small teams and participate in 5v5 matches. Their main objective is to destroy enemy towers. The first team to destroy all enemy towers or the team that destroys most of them by the end of the game wins. In other MOBA games, a player assumes the role of a unique hero exhibiting diverse traits. In Switchblade for PS4 and PC, however, one gets to drive special vehicles, some of which can fix other cars, some can be used to defeat the opponents with their firepower, while others are simply very fast. The teams should be assembled in such way that the players can support each other during the matches. Moreover, the game features the so-called mobs – small vehicles controlled by the AI. They aid a player in destroying enemy towers, distracting opponents, and attacking the members of the enemy team. The key to success lies in protecting one's towers from enemy attacks and destroying the enemy mobs. Switchblade for PS4 and PC has been based on the popular Unreal Engine technology, which also has been used in the production processes of games such as Fortnite and Gears of War 4.